Pumpkin Curry ??? No ways. Going by the way most people feel about this humble vegetable, I had actually put off posting the recipe. But leafing though my diary to sort out/refresh some of the low oil dishes that I have cooked over the years, I stumbled upon this gem of a recipe. 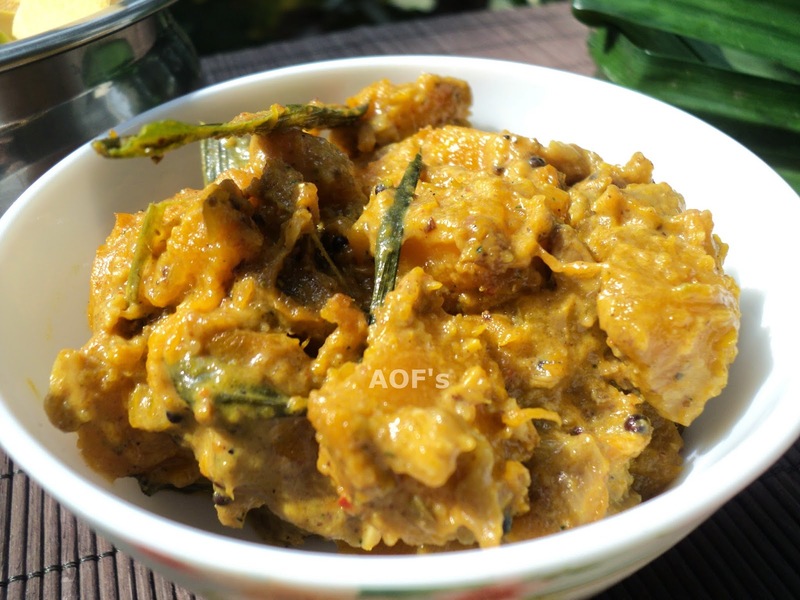 I had first watched this curry being prepared by an old Sri Lankan lady on television but I could not catch all the ingredients that go into the making of this dish. So, when I searched for this recipe on the net, I stumbled upon Dani Venn's blog . She has a great collection of recipes and please do check them when you have the time. Coming back to the recipe, I decided to stay true to the ingredients used (though I skipped the rice and desiccated coconut paste) but made some minor change in the order in which they go into the dish. Call it 'cultural conditioning' or whatever you like, but I could not understand the logic behind adding the tempering ingredients after frying the onion, ginger and garlic :). The curry turned out to be delicious (and amazingly aromatic) despite using so less oil. Preparation - Heat a frying pan. Add the rice to it and roast for 2-3 mins. Then add all other spices (except for turmeric) mentioned under 'For curry powder' and roast till they give off their fragrance. Cooking - Heat the oil in a wok. Add the broken red chili, mustard and fenugreek seeds to it. Once they start popping, add the onions. Fry till translucent. Add the chopped ginger and garlic. Fry for 2 mins before adding all the powdered spices. 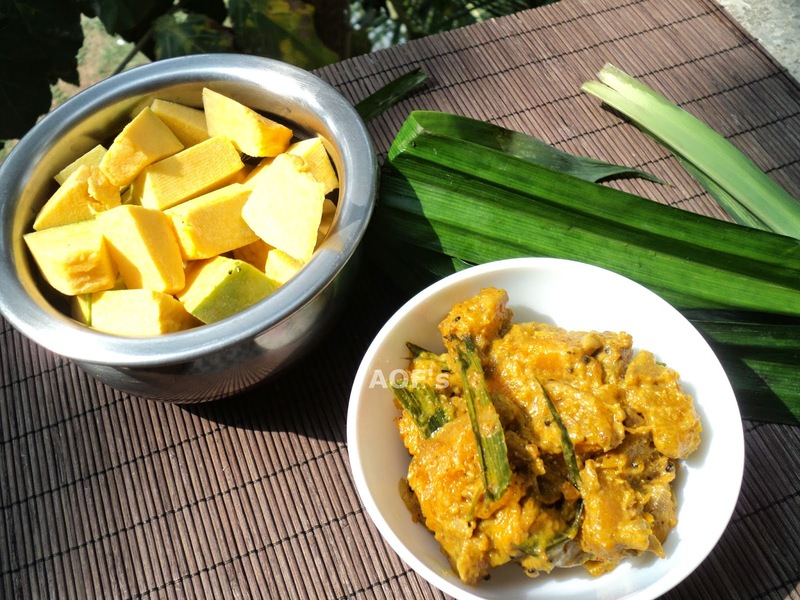 Fry for a minute and then add the curry leaves, pandan leaves and pumpkin cubes. Add the coconut milk to the wok and let it simmer on a low flame. 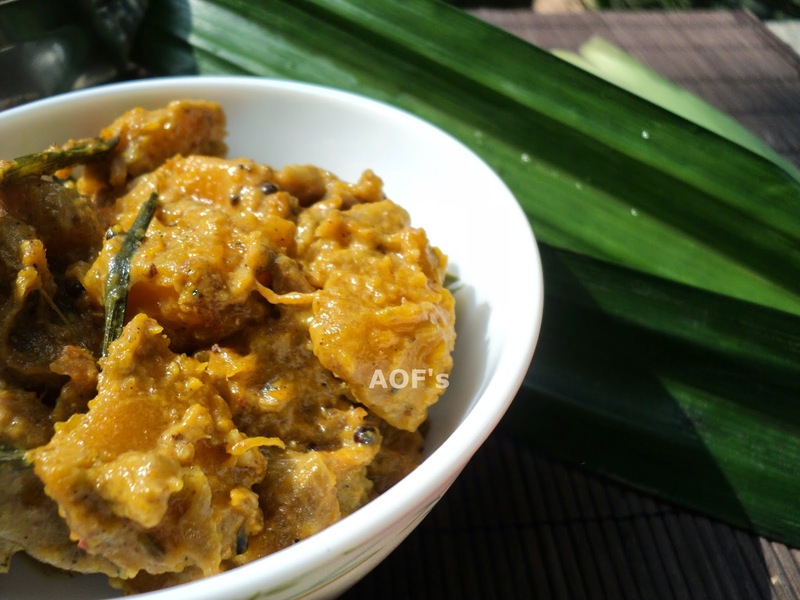 Once the pumpkin is cooked, add 2 levelled teaspoons of the curry powder and mix it well. (Add more curry powder if you like it spicy). Remove from the flame and serve hot with white rice and yogurt.